Today is National Vanilla Milkshake Day, but we want BACON! So let's make a Bacon Milkshake!! Cook bacon in a frying pan on the stove top until good and crispy. Drain on a paper-towel covered plate and allow to cool. In a clean pan or a toaster oven, toast the walnuts. In a food processor, grind the bacon (save a slice or two to crumble on top!) and walnuts together until fine. In a blender, combine bacon, walnuts, ice cream, maple syrup, and milk and blend until smooth. You may want to adjust the milk and/or ice cream to satisfy your shake-thickness preference. 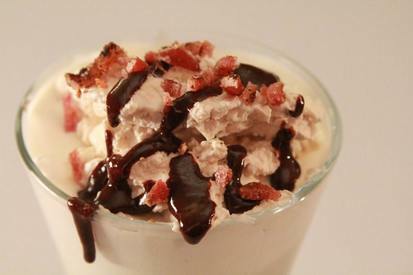 Garnich with crumbled bacon, chocolate syrup and whipped cream. Serve immediately in a tall glass with a straw.